The System x3250 M6 offers a wide range of processors - from Intel Celeron to Intel Xeon E3-1200 v5. With support for a memory capacity of up to 64 GB and internal storage of up to 48 TB, the x3250 M6 is ideal for small- to medium-sized business, workgroups, distributed locations, and webscale workloads. This Product Guide describes withdrawn models of the Lenovo System x3250 M6 with the Intel Xeon E3-1200 v5, Core i3 6100/6300, Pentium G6100/6300, and Celeron G3900 Series processors. For currently available models of the Lenovo System x3250 M6 with the Intel Xeon E3-1200 v5/v6, Core i3 7100/7300, Pentium G7100/7300, and Celeron G3900 Series processors, see the following Product Guide: Lenovo System x3250 M6 (Intel Xeon E3-1200 v5/v6, Core i3, Pentium/Celeron G Series Processors). 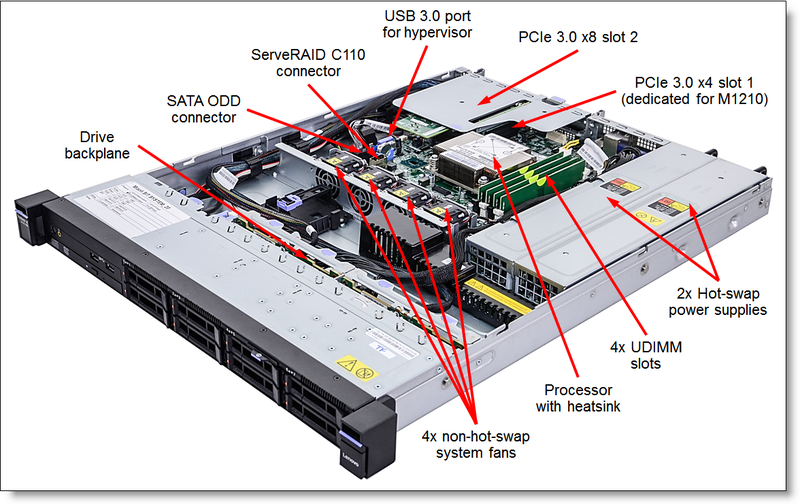 The System x3250 M6 (3633/3943) server models with the Xeon E3-1200 v5, Core i3 6100/6300, Pentium G6100/6300, and Celeron G3900 Series processors that are described in this product guide are withdrawn and no longer available for ordering. The System x3250 M6 offers a wide range of processors — from Intel Celeron to Intel Xeon E3-1200 v5. With support for a memory capacity of up to 64 GB and internal storage of up to 48 TB, the x3250 M6 is ideal for small- to medium-sized business, workgroups, distributed locations, and webscale workloads. The Intel Xeon processor E3-1200 v5 product family improves productivity by offering 4-core processors with up to 3.7 GHz core speeds and up to 8 MB of cache to provide affordable single-socket system performance. Up to four 2133 MHz DDR4 ECC UDIMMs provide speed, availability, and capacity of up to 64 GB. Intel Celeron Processor G3900 product family with two cores up to 2.9 GHz, 2 MB cache, and 1866 MHz memory speed. Operating systems Microsoft Windows Server 2012, 2012 R2, and 2016; Red Hat Enterprise Linux 6 (x64) and 7, SUSE Linux Enterprise Server 11 (x64) and 12, VMware vSphere (ESXi) 5.5, 6.0, and 6.5. The following tables list the standard models of the System x3250 M6. Note: Standard models of the System x3250 M6 are not available in North America. § x in the Model number represents a country-specific letter (for example, the EMEA model number is 3633B2G). Ask a Lenovo representative for specifics. § x in the Model number represents a country-specific letter (for example, the EMEA model number is 3943B2G). Ask a Lenovo representative for specifics. Note: Power cables are not included (except for the models 16A, 16D, 16F, and 16H); see Power supplies and cables for ordering information. The following table lists feature codes for the processors that are available for the System x3250 M6. Lenovo DDR4 memory is compatibility tested and tuned for optimal System x performance and reliability. Lenovo DDR4 memory has a unique signature programmed into the DIMM, which enables System x servers to verify whether the memory installed is qualified and supported. From a service and support standpoint, Lenovo memory automatically assumes the system warranty, and Lenovo provides service and support worldwide. The server supports up to 2133 MHz memory speeds for one DIMM per channel and two DIMMs per channel configurations, provided that the processors support this memory speed (see Processors for details). The following table summarizes memory speeds and capacities that are supported by the System x3250 M6 server. The following tables list currently available drive options for internal storage of the System x3250 M6 server. Standard and TopSeller models of the System x3250 M6 ship without a power cord (except models 16A, 16D, 16F, and 16H). Country-specific line cords or rack power cables listed in the following table should be ordered together with the server. The System x3250 M6 server models listed in "Standard models" and "TopSeller models" come with the rail kit. In addition, an optional lockable front bezel listed in the following table can be ordered for the System x3250 M6, if needed.